Do you ever have those afternoons you get a ”great” idea and you've all the evening time for that task. The task is a relaxing one and won't need much attention, and you can watch a movie or something. But then, it happens that the evening turns into night as you realize a couple of little details adding complexity to the idea, and the task turns out to be much more invasive to your evening than you thought? In this example, I got the great idea to upgrade my Debian running NAS device (thanks Martin for everything!) to use ext4 instead of ext3. The kind of idea that takes a long time for relatively little practical benefit, but it just feels like a nice thing do when you've the extra amounts of nerd time available. It's basically just opening the NAS device up, mounting its hard disk to a laptop via external case, running the tune2fs and fsck then putting the disk back. It just takes a long time for the initial fsck (to make sure everything's intact) and then the required fsck run to get ext4 mountable. 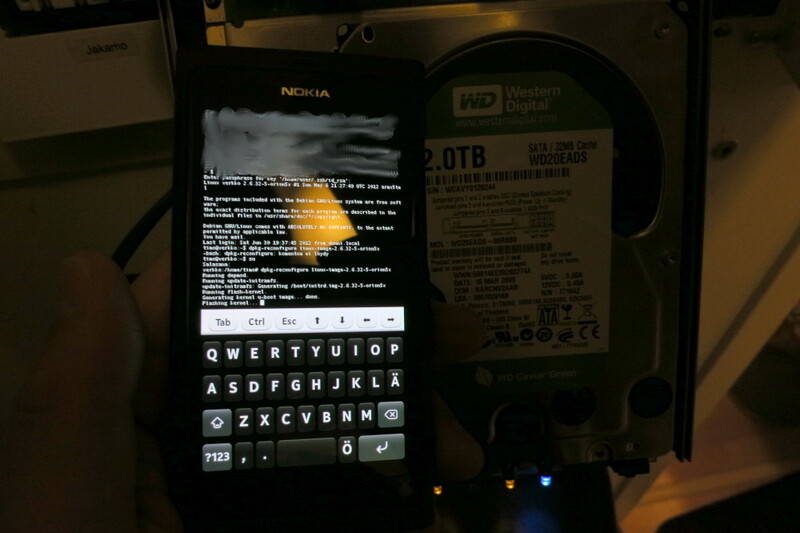 Since I've only one hand in use and can't use a laptop, I'm logging in via my Nokia N9 and then reflashing the kernel + initramfs from this original disk, just to make sure everything is now alright and also after that flashing it still boots (it does!). Note that I feel like the setup is secure enough for non-interrupted flashing so that I can indeed support the NAS with a knee, use one hand to keep N9 and another hand to take a photo with a camera. And so we have had a productive and educating afternoon/evening/night once again. Does this ever happen to you?